The Wharf has been a success in its first year, and there are a lot of ways to get there without using your car, but the rapid density change has made getting around the old-fashioned way a little more difficult. The development’s success has come at a cost to some drivers confounded by traffic backups and parking problems. WASHINGTON — One year ago, a sleepy corner of Southwest D.C. suddenly blossomed into a beehive of social activity. Now, business is booming at the District Wharf, a year after the 24-acre development’s grand opening. An estimated 10 to 12 million people have headed to Washington’s newest waterfront neighborhood, some taking advantage of new transportation options such as the Water Taxi and free jitney service. But the rapid density change has made getting around the old-fashioned way, by car, a little more difficult. The development’s success has come at a cost to some drivers confounded by traffic backups and parking problems. Traffic troubles notwithstanding, developers and most patrons see the first phase of The Wharf largely as a commercial and societal success, with another 1.15 million square feet of hotel, residential and retail space planned to open by 2022. “There are lots of ways to get to The Wharf without actually getting in a car,” said Bob Rubenkonig, executive director of The Wharf Community Association. 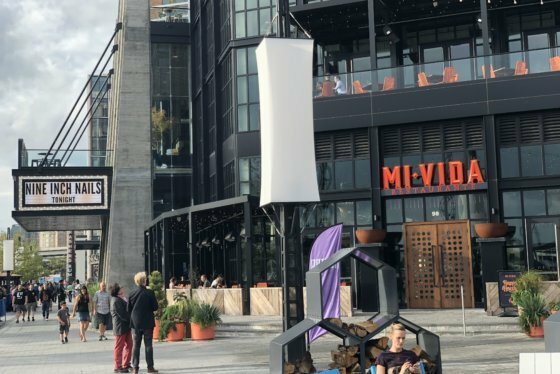 When The Wharf opened on Oct. 12, 2017, it brought a number of restaurants, retail shops and music venues to D.C.’s Southwest waterfront. One year later, new businesses are still moving in. Here’s a look at The Wharf’s impact in its first year. The development has parking for nearly as many bicycles as for motor vehicles — more than 1,000 bikes above and below ground, in addition to Capital BikeShare stations throughout the neighborhood. “You can get here by driving but I would also say walking, taking your bike, riding here on the Water Taxi — the jitney is a great way to go. The Wharf Shuttle is a free service that’s pretty terrific as well, as the new Circulator route,” Rubenkonig said. Rubenkonig said the below-ground parking spaces for cars can be hard to come by. The parking garage, he estimated, reaches capacity about five days a week. The Wharf’s social media team sends push alerts on their app, as well as alerts on social media, when the roughly 1,400 spaces are taken. When the garages are full, Rubenkonig suggests drivers “think about parking up at L’Enfant Plaza and walking down the brand-new Banneker Overlook stairs. It’s really easy and the view of The Wharf from the Banneker overlook is amazing.” He also noted that there are many other public parking areas near The Wharf. The new Circulator route opened earlier this year, connecting Eastern Market and L’Enfant Plaza. The line runs down M Street and makes stops near The Wharf and Arena Stage. The Wharf and its nearby partners in Southwest also operate a free shuttle service with 10-minute headways. The Southwest Neighborhood Shuttle has ferried about 40,000 people per month between the National Mall and The Wharf since it launched late last year. For a more nautical experience, the free jitney carries travelers, and even their pets, from the Recreation Pier to East Potomac Park, where additional parking can be found. With the launch of the Water Taxi early this year, commuting on the Potomac River is now possible, but persistent tidal flooding and debris has limited service to and from Georgetown at times. From the start, architects and planners designed the enclave to be multimodal, with a focus on foot traffic. The Belgian block cobblestones, curbless streets and narrower passageways have naturally slowed drivers down. With Maine Avenue bearing the brunt of the through traffic, drivers who do end up meandering through The Wharf have instinctively yielded to pedestrians. “From the opening day, pedestrians are comfortable and have taken charge. Motorists need more time,” said Stan Eckstut, the principal architect for The Wharf’s first phase of construction. The streets and alleys within the development are a haven for walkers. The materials and varying textures borrow ideas from many pedestrian-friendly corridors in European cities. Some of the cobbles have shifted over the last year, and The Wharf said it will be grouting and making repairs through November. “Like everything at The Wharf, the streets will take some time to settle down and settle in. It has to get comfortable with its new clothes,” Eckstut said. The more than 50 shops and restaurants at The Wharf require a daily supply of products and goods. While some businesses have their own loading docks, others do not. Truck drivers have expressed frustration over not having adequate space for deliveries. Property managers have been telling truck drivers to offload on Maine Avenue. Car drivers have, in turn, been frustrated by the backups caused by the daily double-parked delivery trucks. All parties insist enforcement of traffic laws is scant. “We certainly need a loading dock that is capable of supporting trucks larger than 26 feet and that have ramp access for trucks,” said Johnny Nuckols, director of purchasing for Officina, an Italian shopping hub set to open this weekend. The community’s pedestrian-friendly streets are not so friendly to drivers of big trucks such as Nuckols, who said the designated drop-off zone on Maine Avenue is insufficient. The loading docks in the alleyways can only accommodate trucks shorter than 30 feet. The Wharf property managers have started asking vendors to use smaller box trucks and vans capable of turning into the development’s berths, instead of clogging up Maine Avenue. But the proximity of an interstate highway may be alluring to operators of big trucks who want to move more product at a time. “I get complaints all the time,” said Gail Fast, ANC commissioner for 6D01. During the afternoon hours, double-parked alcohol delivery trucks have become the norm. The backups often ripple onto Independence Avenue and can even build onto the Southwest Freeway, causing delays for drivers as far away as the 14th Street Bridge. “When you have an entire lane that may go a block, a block and a half long because there’s four, five, six delivery trucks, that can be extremely frustrating for my constituents and the residents who live in Southwest,” Fast said. Fast said many residents feel that the city doesn’t understand the extent of the gridlock and traffic issues that have only worsened since the opening of Audi Field. Many residents expressed these concerns years before The Wharf’s buildings began to take shape, and feel the District has fallen short of their promise to properly manage traffic. “When it comes to parking enforcement along The Wharf, DPW parking enforcement officers issue tickets as they spot violations — just as they do in all parts of the District,” said Chris Shorter, director of the D.C. Department of Public Works. Shorter said that parking enforcement officers have written 1,240 citations for violations on a stretch of Maine Avenue between the Fish Market and Arena Stage in the last three months. Fast, her constituents and even some development representatives believe the enforcement of commercial loading and other traffic safety laws on Maine Avenue has been inadequate, a lament echoed throughout most neighborhoods in the District in recent years. “We try to be the best community partner that we can be and I know that there are, at times, frustrations from delivery trucks and folks who are trying to service some of the retailers in the restaurants here at The Wharf. At the same time, I think that that’s a part of urbanity,” Rubenkonig said. The delivery dilemma is not a phenomenon unique to The Wharf, and neither is a similar bottleneck caused by successive ride-sharing vehicles such as Uber and Lyft stopping in the middle of travel lanes for passengers. Although DDOT has provided dedicated curb space outside Anthem for both modes, ride-sharing vehicles frequently spill into the through lanes of Maine Avenue before and after large concerts and during big events such as The Wharf’s wildly successful Petalpalooza festival. There have been calls to eliminate the metered parking on Maine Avenue to carve out more space for deliveries and disembarking passengers. “For that curbside, we’re constantly monitoring the site and always searching for better ways to manage it,” said Evian Patterson, associate director for parking and ground transportation at the District Department of Transportation. 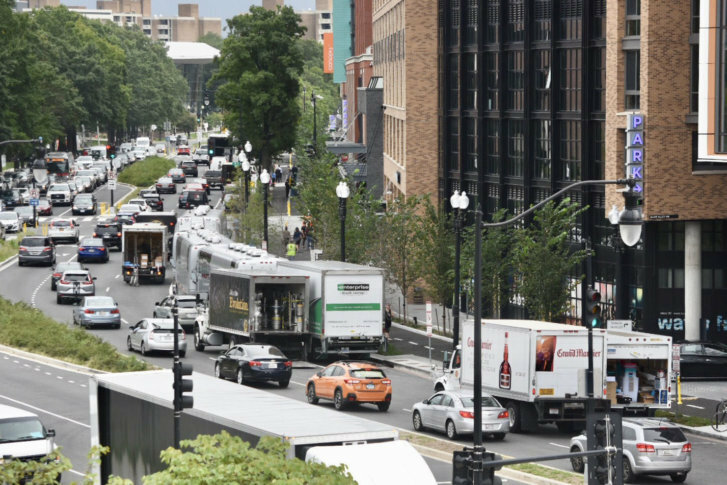 Patterson points to the recent changes and stepped up parking enforcement along Connecticut Avenue in Dupont Circle as a possible solution for the recurring congestion near The Wharf. He said the agency has no imminent plans to change the number of through lanes or turning lanes near the development. A 2017 study commissioned by The Wharf concluded that, instead of investing in widening roadways to alleviate capacity concerns, a better strategy to minimize traffic delays would be for The Wharf to promote the use of alternate forms of transportation. Widening roads such as Maine Avenue, the study said, would not be desirable due to the negative impact it would have on other modes. The Wharf staff continues to promote the venue’s accessibility by land and water, and Rubenkonig said they are working with police, DDOT and residents to mitigate traffic delays. “Space is tight but I would submit that that’s a part of living and working in D.C. I don’t think that this is something that is particular to The Wharf. I do think that you have this really wonderful combination of places where you can dine, where you can go to shop, where you could work, where you come to take a boat or go to the oldest fish market in the country … The Wharf has been a success, but with that success comes some growing pains,” he said.